Turmeric belongs to a group of plants called Rhizomes. Ginger is another example of a rhizome. In fact, to an untrained eye it is hard to differentiate fresh ginger from turmeric! Of course we are all used to seeing turmeric only as a powder and recognize it’s bright, yellow color. It is a mystical and magical plant that mankind has known for over 4000 years. In Sanskrit alone there are 53 words to describe Turmeric! (i) Its mystique perhaps lies in its versatility. It is one of the few plants used extensively as a spice in cooking, as a beauty aid, a medicinal ingredient and as a dye. In fact Buddhist monks have been reportedly using turmeric as the dye for their robes for 2000 years! (ii) Its magic lies in the fact that in each it is used in minuscule quantities, typically no more than a pinch! Turmeric grows in India and other tropical parts of South East Asia. This beautiful perennial loves hot weather and has been known to grow as tall at 5-6 feet with very strong roots. These roots have bulbs that help aid in the production of turmeric plants year after year and are known as Rhizomes. This ‘super’ spice primarily used in cooking both as a flavoring and coloring agent; with its slightly bitter yet sweet undertone taste, sprinkled in curries to enhance their beautiful color and flavor and last but not least now being recognized in medical and pharmaceutical uses. Turmeric contains an alkaloid called curcumin, a powerful antioxidant. 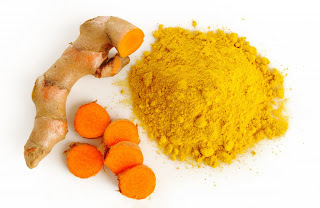 It is Curcumin that is also responsible for the rich yellow color. Incidentally, as an anti-oxidant, (important in fighting free radicals and hence in cancer treatments), it is eight times more potent than Vitamin E(iii) and three times more powerful than Vitamin C(iv). More traditionally it is used to soothe upset stomachs, ease liver problems, as an anti-inflammatory agent and as an antiseptic used to gargle along with salt and hot water.